Often, nature can provide the ideal analogy for the business environment. In the natural world, ecosystems thrive through the balance struck between organisms relying upon each other for inputs, outputs and by-products - checks and balances essential to maintaining the health of the ecosystem. Just as ecosystems in the natural world are complex networks of interconnected activity, the same is true of Tata Chemicals Europe. It is really no different: the production of sodium carbonate (soda ash), salt, sodium bicarbonate (bicarb) and energy all operate together, creating the ecosystem that generates stability and opportunities for growth. And it’s not just linking of products in production systems; the wider economic environment also influences the health of the company. Soda ash is a commodity, heavily influenced by the global economic cycle, British Salt and bicarb production operate in very different markets, meaning that together the risks to the overall business are reduced. So, who does what for who at TCE? British Salt, bicarb, energy and soda ash all operate in markets that have different influences, helping to smooth the peaks and troughs of the economic cycle for TCE as a whole. A key pillar of the TCE ecosystem is the manufacture of soda ash. There are two methods of soda ash production; the mining and refining of the mineral trona in operations such as those undertaken by Tata Chemicals in Wyoming, USA, some of which TCE supplies to its UK customers, and the synthetic route employed by TCE in the UK where, in common with other European countries, there are no trona deposits. How is Synthetic Soda Ash Made by TCE? The synthetic soda ash process requires raw materials to produce both light and heavy soda ash, including salt, limestone, water, coke, ammonia, heat and electricity. The reaction route used to turn salt and limestone into sodium carbonate is known as the Solvay Process. It is a continuous process and the first step involves burning limestone to produce carbon dioxide. This is then bubbled through a salt solution which has been pretreated with ammonia. The resulting reaction produces sodium bicarbonate crystals which are filtered from the reacted solution and heated to form sodium carbonate product. This stage of the process also produces carbon dioxide gas which is recycled to join the carbon dioxide stream coming from the burnt limestone. The reacted solution, left over when the crystals have been filtered, is heated to recover the ammonia, which is then recycled to treat the fresh salt solution coming into the process. The initial output is a low-density soda ash (light ash). As well as being sold to industrial customers for use in a range of applications, some of the light ash is redissolved, recrystallised & dried to form a high-density ash (heavy ash) at Lostock. TCE also use light ash to purify brine at British Salt and it is the input material for the production of sodium bicarbonate at both Lostock and Winnington. 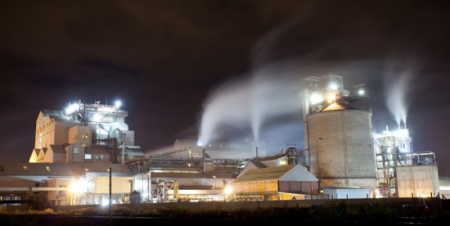 Around 22% of the light soda ash produced at Lostock is used for bicarb production, demand for which is growing globally every year. Where does the steam from the Winnington CHP plant fit in? The soda ash process requires a considerable heat input, mainly to produce the light and heavy ash crystals, but also to recover ammonia, after the main reaction has taken place. TCE have a dedicated, natural gas-fired Combined Heat and Power (CHP) plant to provide all the heat required to carry out these operations. Not only does Winnington CHP provide this heat in the form of steam, it also provides electricity to power compressors, pumps, filters and control systems used in the production process. What proportion of energy that TCE generates is used at TCE sites? The high demand for heat and electricity in the production of light and heavy soda ash at Lostock and bicarb at both Winnington and Lostock creates the main base load for the energy generation plant. In fact, out of the 53MW and 150 tonnes per hour of steam TCE generates every day, 90% of the steam and 25% of electricity is used by our own energy intensive production plants. The remainder goes to other local customers sharing our site or to the local electricity grid. Following the reconfiguration of the CHP in 2015, its normal operating efficiency now exceeds 80%, which is best in class. This means the manufacturing sites are provided with the heat and electricity that has a low carbon footprint, whilst supplying excess electricity to the local network. In this short summary, we’ve covered how TCE operates in its own robust ecosystem that supports each pillar of the business where together strength, reliability and opportunities for future growth are created. If you’d like to know more about our business please contact us on sales-tcel@tatachemicals.com.